Did you know that silver loves to be used? We often get asked how we keep our silver ware so bright and shiny. The best way to keep this way is to use it frequently, silver just loves to be used. Of course all silver needs polishing at some stage...I remember the hours spent polishing as a child before Christmas Day when the good silver was brought out for its once a year airing...ugh, the silver was often black with tarnish. Tarnish occurs when the silver oxidises or reacts with the oxygen in the air to form a black coating. This occurs in much the same way as rust on iron. Once black the silver takes a bit of elbow grease to bring it back to a beautiful finish. If the silver is used often this will not happen in fact it creates a soft patina only use can create. To polish your silver, first wash in warm soapy water and dry with a soft cloth. 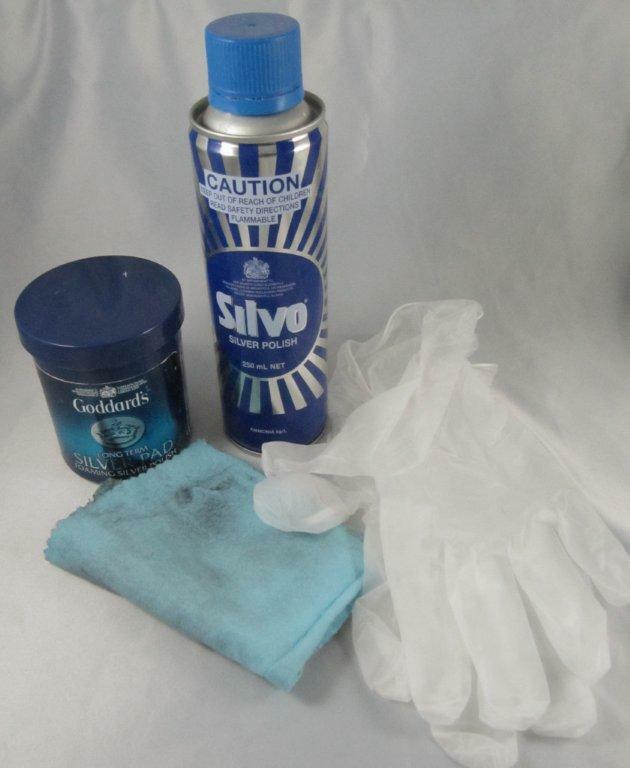 Gently polish with a propriety silver polish, we use Silvo and/or Goddards Silver foam, both readily available in Supermarkets or on line. Silver Foam is good for lightly tarnished pieces but ineffective with heavy tarnish. To keep the silver looking good between polishes we give a gentle rub with a silver cloth. There are many brands of these available again either in the Supermarkets or on line. When using Silvo be generous with the liquid. We put it in a small vessel eg a lid and constantly soak the cloth so it is wet when applied. It is recommended that you use gloves otherwise your hands will be black when you finish! Now all is nearly done. Look carefully at the centre fork. There are dark bands across the middle which were not visible before. These are caused by rubber bands used to keep the pieces together. The rubber causes at the best, dark tarnish like this or at the worst deep corrosion removing silver to the base metal. Not a good way to store silver. We need to work a little harder to remove these marks. You will need an eraser, the type used to remove ball point pen. Carefully rub along the lines of tarnish with a gentle back and forth motion until the black is removed. The silver will now be finely scratched and appear as dull. Next is to polish again with Silvo to a bright reflective finish. This is something that can be done for any dark spot but be careful not to rub too hard or else you will remove the silver plating altogether and be left with the base metal showing. It is always a good idea to err on the side of caution. I have left a faint mark behind which I find acceptable. Next more Danish cutlery, this time a solid silver knife and child's fork. Both cleaned easily with a soft cloth soaked in Silvo. 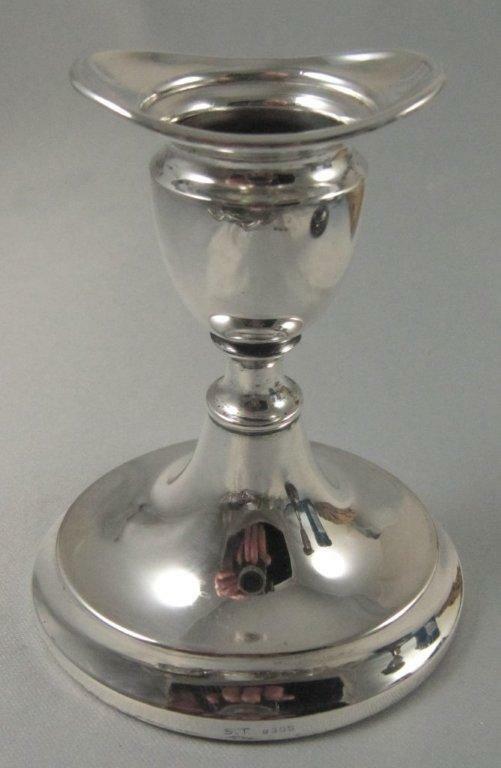 The last before and after is of a solid silver candlestick. It was covered in wax as can be seen and heavily tarnished. I tipped it upside down in a jar of very hot water to melt the wax. I then removed the molten wax from the top of the water with a paper towel before removing the candle stick so the wax did not re adhere on its way out of the water. Once dried I applied plenty of Silvo on a cloth and after a short while of polishing it came up a treat. It gives me pleasure to restore something that looks so ordinary into something beautiful especially when it doesn't take long!